The Big 12 regular season ended Sunday night for KU with a win against Texas on Senior Night. With the regular season finished, awards must be given to the deserving candidate. 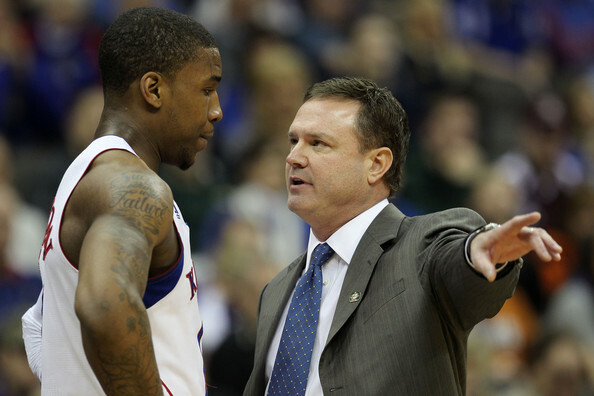 The Conference player of the year was a no brainer; it was Thomas Robinson. Robinson was the best player on KU for the entire season. He averaged 18 points, 12 rebounds, and 2 assists a game at the power forward position. The big man from Kansas is also a major contender for James Naismith National Player of the Year Award. Although he is a junior, he is expected to declare for the 2012 NBA draft and should be a top ten selection. The Defensive player of the year in the Big 12 conference is also from KU, which is center Jeff Withey. In Withey’s first year of major contribution at Kansas, he managed to become a defensive force at center. Withey, only a junior, led the conference with 100 blocks and averaged 6 rebounds a game for KU and was Third Team All Conference due to his defensive contributions for the Jayhawks. To add to all these awards, the Kansas Jayhawks had two players make First Team All Conference: Robinson and Tyshawn Taylor. Robinson and Taylor were KU’s two best players all season, both players in different instances throughout the season put KU on its back and lead them to victory. Taylor, a senior guard from New Jersey, averaged 17 points and 5 assist for the Jayhawks this season. Although Taylor seemed incapalbe of throwing the ball to the right team for the first half of the season, he caught on during conference play and was vital as the season progressed. Bill Self yet again proved he was the best coach in the conference by winning coach of the year and coaching the Jayhawks to an unheard of 8 straight conference championships in a row. This was Bill Self’s best year of coaching at Kansas, this team is arguably the least talented he has had. The expectations for the KU basketball team this year were not as high as it had been in previous years. In the preseason AP Top 25 Kansas was ranked thirteenth with Baylor a team from their own conference ahead of them. With the regular season over, the Jayhawks finished third in the AP Top 25 and the USA Today Coaches Pull, which puts Kansas in contention for a number one seed in the upcoming NCAA Tournament. Coach Self looks to continue his success of dominating the Big 12 in the Conference Championship. This entry was posted in Basketball, Basketball, Home, Midwest, National, Uncategorized and tagged Bill Self, Kansas Basketball, Thomas Robinson, Tyshawn Taylor.